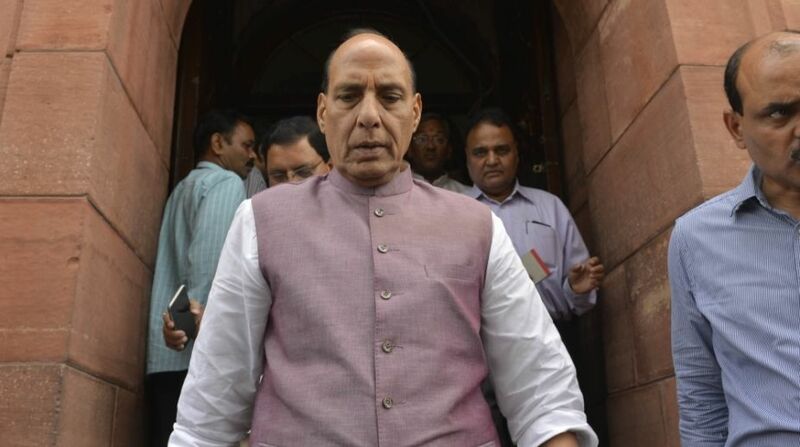 Union Home Minister Rajnath Singh on Sunday said that the Centre was working towards a permanent solution to the Kashmir problem, though he did not elaborate. “Whatever steps we are now taking in Kashmir is towards a permanent solution of the issue. I will not like to clarify much, and it would not be proper too. Kashmir should maintain its identity,” he said in his address at the India TV conclave ‘Vande Mataram’ here. He said that there has been a decline in stone pelting incidents in the Valley but they should totally stop. “We are not satisfied with this. Stone pelting must stop altogether. We have to provide jobs to Kashmiri youth,” he said. On the PDP-BJP government in Kashmir, Rajnath Singh said that the common agenda of governance is an “experiment which is continuing”. The Home Minister reiterated that the Centre “never closed the doors for talks”, even with Hurriyat leaders, and they are “still open”. On return of Kashmiri Pandits to the Valley, he said that during the tenure of late Chief Minister Mufti Mohammad Sayeed, it was agreed that they would be rehabilitated. He said that talks with Pakistan have halted for now but if the neighbouring country assures India that it will not let its soil used by terrorists to perpetrate attacks against India, talks can resume. “Pakistan will have to change (its stance), Aaj nahin sudharega, toh kal sudharna padega (if not today, they will have to change tomorrow),” he said.